Trade shows are a a strange and fun time. For a weekend I got to build a pop-up shop of the world of Ewe Ewe and introduce yarn shops from across the country to our yarns and patterns. This was my booth for three days and it was a fun place to be! Lots of Wooly Worsted merino yarn to squish and squeeze. Plus we show off all of our knitting and crochet pattern samples for yarn store owners to choose what works best for their shop. 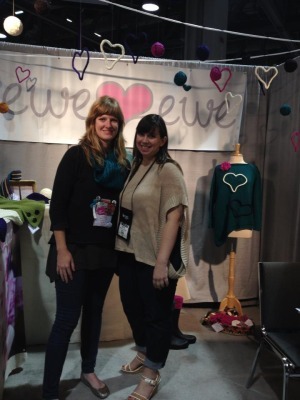 You get to make new friends like Sophie from Bluebird Yarns & Fiber Crafts... our newest shop in Sausalito, CA! And get interviewed by Fiberstory.tv ...video, coming soon! It was a great show and we have lots of new patterns and products to share. Plus Ewe Ewe Wooly Worsted yarn is coming to a bunch of new shops across the country!